The Royal Scottish Country Dance Society (RSCDS) San Francisco Branch has an extensive bookstore available to its members and visitors. We have many items that are produced locally here in Northern California featuring the talented members of the San Francisco Branch. NEW! We have now implemented online ordering! You'll need a Paypal account, but that will allow you to use a credit card. Try it! If you are ordering from outside the US or Canada, please expect a request for additional shipping costs. Once your check is received, Jane will mail the item to you. If you are located within the US or Canada, please add $2.25 for shipping for each item. If you are located outside of the US or Canada or if you are ordering more than one item, please email Jane to verify the amount necessary for postage before sending a check. A Camp of Pleasure - Ancient & Modern Music f (CD) The Berkeley Scottish Players formed in 1973-74 and first performed in public in October 1975 with a seminal performance at the San Francisco Branch Weekend in Burlingame. . In 1976 the band became the first American band to record and LP album. Now, 25 years later, this historic album is still influencing dancers and musicians, and most of the greater family of the Berkeley Scottish Players, though widely dispersed, can still be spotted playing a Scottish tune upon occasion. After the Dance (CD) A lively collection of airs, marches, strathspeys, reels and jigs (not dance arrangements), with a couple of songs from guest Ed Miller. John on fiddle with support from Brian McNeill, Rich Brotherton, Lawrence Drummond, and Stuart, Lesley and Fiona Taylor. Produced by Brian McNeill. 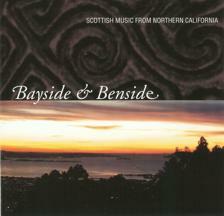 Bayside & Benside - Scottish Music from - This musical project celebrates the ties between Scottish traditions in the homeland and in the New World. Besides music, one such tradition finding a home in the San Francisco Bay Area is the Scottish sport of Shinty, long a part of Highland culture. The Northern California Camanachd Club was founded in 2001 and has worked to foster interest in Shinty. The sales of this CD will help to raise fund for the first U.S. Shinty Club and allow them to continue to present this ancient Scottish pastime to new audiences in California. 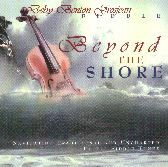 Beyond The Shore - Navigating Traditional and Unc (CD) Deby Benton Grosjean on fiddle with William Coulter, Chris Caswell, Paul Machlis, Barry Phillips, Dennis Patterson, Lars Johannesson, Shelley Phillips, Jack Gilder, Jay Salter and Stan Poplin . Like converging currents, ancient and modern Celtic oceanic lore merge in this conceptual recording. The narrow focus of this project inspired Deby to pursue new euphonious directions - those of the environment and its musical imagery. This is a great listening CD. for tune samples, photos, and more information. We are truly honored to have so many enthusiastic fans worldwide who have asked for this, our third recording...we hope you enjoy our signature blend of traditional and modern music for Scottish Country Dancing as much as we enjoy playing it! The Players: Caryn Palmer - flute, Carol Ginsburg - piccolo; Barbara Bouwsma McOwen & Vaughn Wolff & Margo Leslie - fiddle; Jane Landstra - fiddle, hammered dulcimer, bass; Ken Embrey - fiddle, concertina, tenor banjo, bass; Robert McOwen - guitar, bass; Paul Machlis - piano; Roy Kaitner - snare drum. This second album by the historic Berkeley Scottish Players presents a number of dances requested by our local San Francisco Branch RSCDS teachers – a 28-bar reel, a 40-bar jig, a 24-bar strathspey, a "slow jig" – as well as some perennial favorites that appear on program after program, but with our unique blend of instruments. We originally met as dancers and carried the dance force into our music. The band played for many local events in the 70s, and were invited to play further afield in Fresno and Victoria. Scottish music is still a driving force of the band members who now live miles apart but are occasionally able to meet up and play some of our choice tunes from the old days. All Tunes composed By John Taylor, John plays fiddles on all tracks, and guitars on track 8. All other instruments by Phil McCudgie and the Conveniences. Thirteen tracks from 2013… Lucky 13! 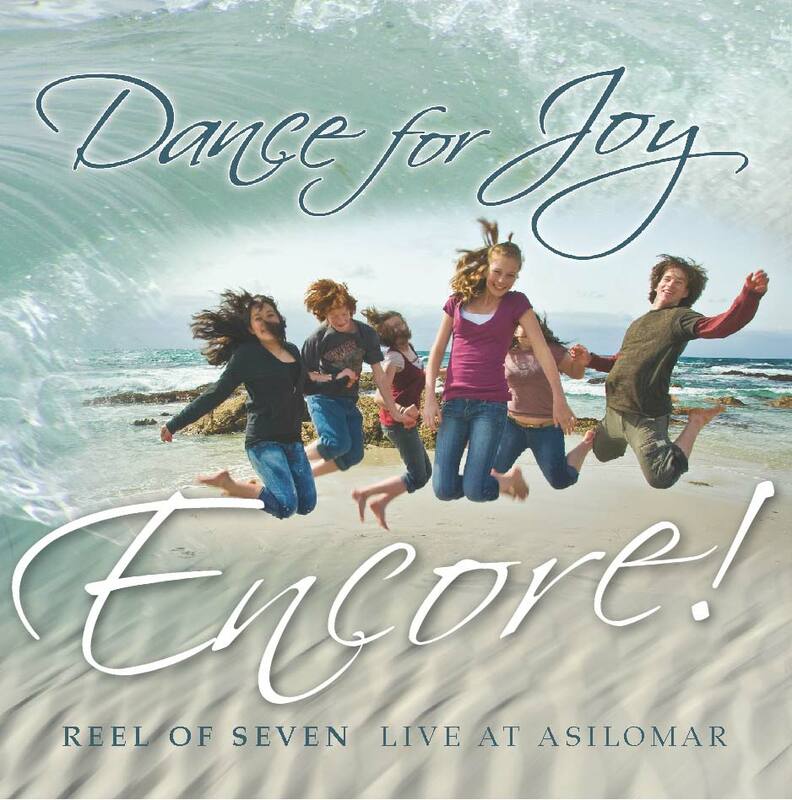 This is Scottish Country Dance music recorded in a live setting, you can hear the energy of the dancers infusing the tracks with a special vitality. But these sets are more than just dance music. With a tune selection ranging from 18th century classics to modern favorites, from toe-tapping jigs and driving reels to lyrical strathspeys and lovely waltzes, there is a lot to provide listening pleasure. Please join us for an evening's music, and dancing, fun! (CD) Deby Benton Grosjean - "A fiddle tune is like a photographer's snapshot. Its musical imagery can evoke the senses - the smell of damp peat below one's feet, the soft tickle of summer rainfall on a chilled cheek, or the vision of rich grassy colors of the vast green moors." Another beautiful offering from Deby Benton Grosjean. Lively, string-based contra dance sets - reels, jigs and waltzes - with original and trad. tunes. StringFire features excellent musicians with great reputations in their own right. This frolicking, high energy group is guaranteed to get you grooving and inspire your dance moves. Often playing as a trio with JAMES MACQUEEN on fiddle, PATTI COBB tickling the ivories, ERIK IEVINS rounding things out on bass and cello, StringFire adds another fiddle whenever possible, choosing from a select group of high caliber players including Caroline McCaskey, Shira Kammen, and Annie Rodier. The Breakdown - Thirteen Scottish Country Dances in Strict Tempo - Lyle Ramshaw, Susan Worland Bentley, Michael Bentley - A spirited collection of dance sets from John and Jennifer Kelly, the same people that brought you The March Hare. the devil's quandary - Deby Benton Grosjean and Andy Imbrie provide the music to accompany the recently released book of new dances by Bob Mc Murtry. Tunes both traditional and original are performed by two of the best, accompanied by Bob on percussion and recorder. Twelve dances and a lovely waltz set make up this CD. 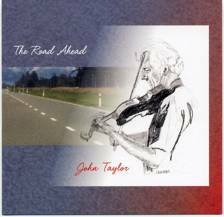 The Road Ahead - John Taylor (CD) Another incomparable collection of performances by John Taylor with his friends Brian McNeill, Stuart Taylor, Lesley Baily, Lawrence Drummond, Pamela Laine and Joe Weed. 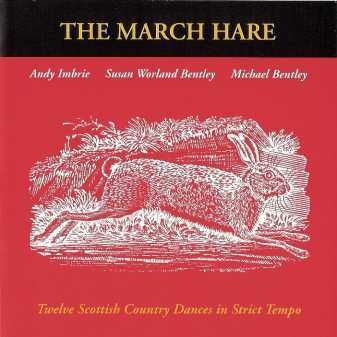 The March Hare - Twelve Scottish Country Dances i (CD) Susan Worland Bentley on violin, Andy Imbrie on piano, and Michael Bentley on bodhran join to offer music for twelve dances. Produced by John and Jennifer Kelly. Not your typical Scottish Country Dance band! A compilation of traditional and modern tunes for SCD recorded live on tour in New Zealand -- high energy, beautiful harmony, fiddle power! Can't stop dancing! Chocolate & Champagne . The Sacramento Branch celebrates twenty-five years of dancing with twenty-five dances written by members of the Sacramento Branch. 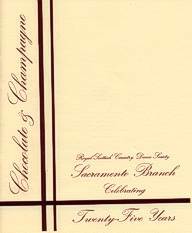 The theme: chocolate and champagne! Dragonfly. 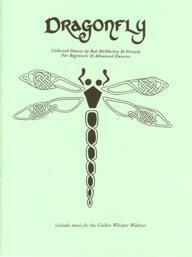 Collected Dances by Bob McMurtry & Friends For Beginners & Advanced Dancers. Also includes music for Golden Whisper Waltzes. Kristi Closser, Bruce Herbold, David Newitt and the members of StringFire! This book includes directions for all the unpublished dances on the The StringFire! recording, Excited States. The Aloha Strathspey with its accompanying tune, a modification by Patti Cobb of an original tune by Rebecca King. Stoeln Moments with its tune Stolen Time (which is included in the tunes for On the Boardwalk). Mairrit at Last was recorded, but notincluded on the CD. Please check the StringFire! website: http://www.stringfile.org for more information. Chased Lovers - published by the International Branch of the Royal Scottish Country Dance Society in their book World Wide Weavings. City of Belfast and Linnea's Strathspey are available in books 48 and 47, respectively, published by the Royal Scottish Country Dance Society. Heart of San Francisco A collection of dances from members of the San Francisco Branch of the Royal Scottish Country Dance Society. All proceeds go to support the Valentine's Ball. 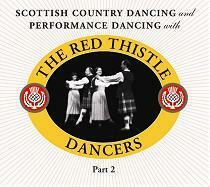 A collection of 50+ or - Airs, Jigs, Reels, Strathspeys and Waltzes by John Taylor. I don't write a lot of tunes. A reel here, a strathsbey there, maybe a waltz or an air. However, after this many years, a tune here and there adds up, as i realized when I was cleaning up recently. Some more memorable than others. Some better than I thought when I originally wrote them. Some of themm not particularly Scottish sounding, but then again, I've lived longer in California than I did in Scottland. For the record, here they are. 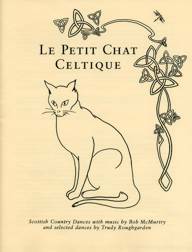 Le Petit Chat Celtique . 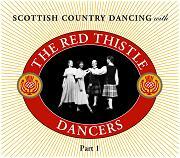 Scottish Country Dances with music by Bob McMurtry and selected dances by Trudy Roughgarden. Let's All Dance - A collection of beginner and audience participation dances. Compiled by two San Francisco branch teachers. Let's All Dance, Too - More beginner and audience participation dances. Measure of Pleasure - 27 Scottish Country dances with 5 original tunes written by and for members of the San Francisco Class, The Royal Scottish Country Dance Society, San Francisco Branch. Mt. Diablo Collection - a collection of 12 Strathspeys by Eugene Bissell. 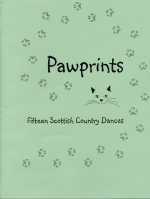 Pawprints - Fifteen Scottish Country Dances from the Sacramento Branch. Devisors are Peggy Hamilton, Sandra Kesler, Margo Glenn-Lewis, Lynne Lockwood and EB Van Otterloo. Titles include A Basket of Kittens, The Calico Jig, Miss Beans and other feline favorites. 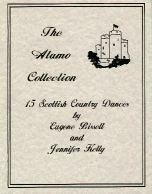 The Alamo Collection by Eugene Bissell and Jennifer Kelly, a collection of 15 dances created by two of the San Francisco Branch's stalwarts. 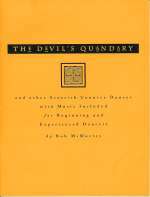 The Devil's Quandary by Bob Mc Murtry, a collection of 60 dances and 14 new original tunes, some by Muriel Johnstone and Andy Imbrie. Half of the book contains dances for beginners and the other half for the more experienced dancers. Figures like the la barrate, set and link for 3 and a couple of Bob's own devising are part of the contents. Audience participation dances can be found as well. The Middle Earth Collection - Twelve Original Scottish Dances, devised by Peggy Hamilton. - Step Dances - A collection of 11 solo and group Scottish Step Dances for intermediate to advanced-level dancers, created by members of the New World Scottish Dancers. - Country Dances - A collection of 19 Scottish Country Dances of various levels, created by or for members of the New World Scottish Dancers. 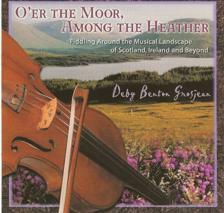 Also included are 4 tunes composed by Steve Wyrick for members of the New World Scottish Dancers. 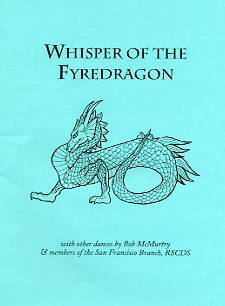 Whisper of the Fyredragon. The sequel to Devil's Quandary! 30 SCD dances of varying levels by Bob McMurtry and members of the San Francisco Branch with some music included. 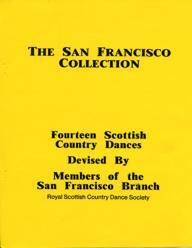 Book The San Francisco Collection - Fourteen Scottish Country Dances devised by members of the San Francisco Branch. Includes the classics, The Six-Penny Jig and Miss Giving's Strathspey. Now available for download individually or in one complete file. These videos are also available for digital download. These videos are also availablr for digital download. - Uncle Barry's Shoe Goo. Members of the San Francisco branch use the silicone treatment, Dow Corning RTV 3140, on the bottom of our dance shoes to reduce the slipperiness of our northern California floors. One tube will treat several pairs of shoes. Instructions for application are included with the "goop". 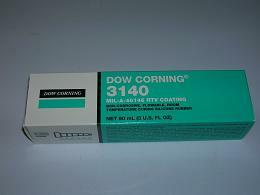 Thanks go to Barry Lewis for testing and discovering this wonderful product.